It was the annual Thanksgiving pot-luck lunch at work. My contribution this year was a yummy stuffing. I’ve also included for the first time a recipe not tested by me. Jolanda made a cranberry salad that everyone loved. I’ve included her recipe and the pics. Preheat oven to 400. Butter a deep 3 qt casserole dish. Place the bread on a rimmed baking sheet and toast until golden about 10 minutes. Transfer to a large bowl. Melt the butter in a large saucepan over medium-high heat. Add the onions, celery, and ½ tsp each of salt and pepper. Cook, stirring occasionally, until softened, about 8-10 minutes. Stir in apples and cook for 2 minutes. Add the broth and bring to a boil. Add the vegetable mixture, parsley, and sage to the bread and toss to combine. Mix in the eggs. Transfer to the prepared dish and cover loosely with foil. Bake for 30 minutes. Uncover and bake until golden, about 12-15 minutes. Combine the cranberries, celery and walnuts. Combine sugar, water and gelatin. Combine cranberry and gelatin mixes. Add pineapple, and stir all ingredients together. Pour in dish and refrigerate for 4-6 hours. Allison requested her childhood favorite for her birthday – cupcakes baked in ice cream cones. I brought canned vanilla butter cream frosting so everyone could decorate their own. Preheat oven to 350. Arrange a dozen ice cream cones in a glass casserole dish. In a mixing bowl, cream together the butter and sugar until light and fluffy, about 5 minutes. Beat in the eggs, one at a time, scraping down the sides of the bowl occasionally. Stir 1/3 of the dry ingredients into the egg mixture. Add in ½ of the buttermilk. Add another 1/3 of the dry ingredients and add remaining half of the buttermilk mixture. Finish with remaining dry ingredients. Stir in lemon juice and zest. Pour the batter evenly into each cone. Bake about 25 minutes, or until cake springs back when touched in the center. This year I got a few recipes from a random book “Christmas with Southern Living 1998”, which my mom found on my grandmother’s bookcase. One recipe was for a twist on the standard chocolate chip. I didn’t add the walnuts, as I don’t like the texture of nuts in baked goods. Beat butter at medium speed of an electric mixer until creamy; gradually add sugars and pudding mix, beating well. Add eggs and vanilla; beat well. Combine flour, soda and cinnamon; gradually add to butter mixture, beating until blended (do not overbeat). Stir in chocolate morsels and walnuts. Drop dough by tablespoons onto lightly greased cookie sheets. Bake at 350 for 9 minutes. Cool on cookie sheets 1 minute. Remove cookies to wire racks; cool completely. Yields 5 dozen. The ginger spice cookies were NOT from scratch. I don’t usually bake anything from a mix, but these looked really good, and the ingredients were all natural. Christina is a vegetarian and requested a vegan cake. I found this recipe online. Shockingly moist and delicious. I couldn’t find a vegan frosting recipe that didn’t sound disgusting, so I just used powdered sugar. Preheat oven to 350 degrees. Lightly grease one 9×5 inch loaf pan. Sift together the flour, sugar, cocoa, baking soda and salt. Add the oil, vanilla, vinegar, and water. Mix together until smooth. Stir in half a bag of semi-sweet chocolate chips. Pour into prepared pan and bake 50 minutes, or until toothpick inserted in center comes out clean. Remove from oven and cool in pan completely. Generously sprinkle top with powdered sugar. Serve. Another birthday, another cake, another first. I got this recipe off epicurious. Slice the strawberries and toss them with 1/2 cup of sugar. Set aside. Preheat oven to 425. Grease and flour 8″ round cake pan. In a medium bowl, combine the flour, baking powder, 2 tbsp sugar and salt. With a pastry blender, cut in the shortening until the mixture resembles course crumbs. Make a well in the center and add the beaten egg and milk. Stir until combined. Spread the batter into the prepared pan. Bake for 15-20 minutes or until golden brown. Let cool partially in pan on wire rack. Slice partially cooled cake in half, making 2 layers. Place half of the strawberries on one layer and top with the other layer. Top with the remaining strawberries, and cover with whipped cream. It was Sara’s birthday. She apparently decided to channel her inner 4-year-old and requested a “dirt cake” for her birthday. I couldn’t remember ever having one, but my mother recently reminded me that we did, in fact, make one for my little brother when he was about 7 or 8. The recipe I used was a slightly modified version from Martha Stewart. Everyone seemed to like it, so I guess it’s a success for children and adults (or maybe just adults who think they are still children). I decided to forgo the usual flower pot presentation. I used a 8″x8″ Pyrex baking pan for my “compost cake” and a 9″x13″ pan for my garden themed dirt cake, which Allie called my “Garden of Eaten”. In another large bowl, whisk together instant-pudding mixes and the milk until well blended. Using a rubber spatula, fold pudding mixture into the very large bowl of cream cheese mixture. Combine until well mixed and color is evenly brown. Fold in the whipped cream until well mixed and color is evenly light brown. In your baking pan or flower pot, alternate layers of cookie crumbs with the pudding mixture. Your first and last layer should be the cookie crumbs. Chill for atleast 4 hours, but preferably overnight before decorating and serving. 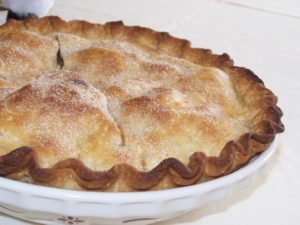 I don’t actually like pie, but my former mother-in-law made an apple pie once that I just loved. She served it warm with a scoop of vanilla ice cream. Delicious! She gave me the recipe, and I finally had a chance to make it this year for dessert at Christmas dinner. Prepare pastry or use ready made 2 crust pastry from Pillsbury. Mix sugar, flour, cinnamon, nutmeg, and salt in large bowl. Add apple slices. Toss gently to mix. Spoon apple mixture into bottom crust. Dot with butter. Cover with top crust. Pinch crust edges together; turn up and in. Pinch again to form stand-up edge Flute. Brush top with milk or cream. Sprinkle with sugar. Slice top crust to vent. Bake in a hot oven at 425 for 35 minutes or until golden brown and juices bubble through slits. Cool pie completely on a wire rack. I’ve tried this recipe before, but couldn’t find unprocessed bran. So, I used flax meal instead. (Odd that was more readily available.) Anyway, it’s one of my dad’s favorites. So I made it for Christmas breakfast again this year. In a large bowl, stir together the flour, flax, raisins, wheat germ, baking soda and powder, and salt. In another bowl, by hand, cream together the butter, brown sugar, and honey until fluffy. Beat in the yogurt, then the buttermilk and vanilla, until well blended. Make a well in the center of the dry ingredients and add the creamed mixture and the eggs. Mix just until evenly moistened. The batter will be thick and slightly lumpy. Do not over mix. Fill muffin papers or greased muffin pan cups with batter. Bake until springy to the touch, about 18-22 minutes. A toothpick inserted into the center of the muffin should come out clean. I was flipping the channels one night and saw this recipe on a PBS cooking show. I modified the seasonings, as I thought their version of the sauce was a bit bland. Heat the olive oil in a skillet. Add garlic. After about 30 seconds, when garlic is sizzling, add tomatoes. Stir and add the basil, oregano, marjoram, and a little salt and pepper. Stir and keep over heat for about 12 minutes to allow sauce to thicken. In a medium sized bowl, mix the ricotta with the beaten egg. Add some salt and pepper. Pour ¾ cup of sauce into a 9 x 13 backing dish to coat the bottom. Cover sauce with a layer of noodles. Cover with a thin layer of ricotta. Cover with 1 ½ cups of sauce. Cover with a layer of noodles. Cover with a layer of ricotta. Sprinkle with pepper. Cover with a layer of noodles and the remaining sauce. Top with fresh mozeralla torn into pieces. Sprinkle with piccarino. Bake for 35 minutes in 400 oven.